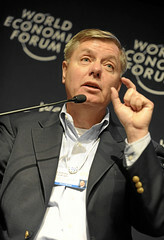 ;Lindsay Graham illustrates the amount of bipartisanship he really expects on climate change. "Realistically, the cap-and-trade bills in the House and the Senate are going nowhere," Graham said. "They're not business-friendly enough, and they don't lead to meaningful energy independence." "It's the 'kick the can down the road' approach," said Sen. Lindsey Graham of South Carolina. "It's putting off to another Congress what really needs to be done comprehensively. I don't think you'll ever have energy independence the way I want until you start dealing with carbon pollution and pricing carbon. The two are interconnected." Can anyone explain to me why we should consider Republicans good-faith negotiators on ... anything?